The tooth is one of the hardest bones in the body. It can withstand being used as a prying and chewing device. Teeth work together to chew or bite into food. Over time this can cause the enamel to disappear. The enamel is the surface coating of the tooth that helps to protect the Dentin. Dentin is the softer part inside the tooth that connects to the nerves. When something triggers a pain reaction from being eaten or drank, chances are that the enamel on your teeth has been worn down and the Dentin is exposed. 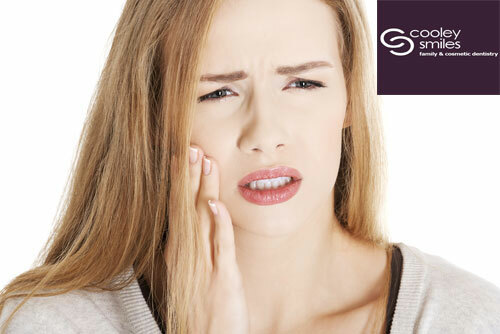 Some people may experience sensitivity, even if there are no underlying issues with their teeth. They may not be able to handle the same exposure to hot and cold items like someone who has less sensitive teeth. This high sensitivity may not be caused by the failing enamel or the lack of brushing, but rather inherited over time as they grew older. • Grinding Your Teeth. When a person grinds their teeth or clenches them together tightly several times a day or throughout the night, the dentin becomes exposed. Grinding and clenching over time will remove the enamel form the teeth. If not properly addressed, it can lead to other issues such as the chipping or damaging of teeth when you eat. • Brushing Your Teeth Too Hard. This can be done accidentally with a hard bristle toothbrush. Brushing your teeth with a hard bristled toothbrush can not only be tough on the enamel, but it can also be tough on you, creating an uncomfortable feeling each time you brush. Brushing your teeth with a soft bristle brush is ideal, but be careful not to over brush or press down too hard on your teeth. • Receding Gums. Receding gums can be caused by a few different things. Brushing your teeth too hard can be one of them. The other reason could be connected to dental conditions like periodontal disease. When the gum recedes, it allows the dentin in the tooth to become exposed, causing pain. • Dental Conditions. One of the most commonly talked about dental conditions is Gingivitis. This condition occurs when the gums become inflamed. Inflammation of the gum tissue can occur infrequently or on a daily basis. Many people who have this dental condition also experience higher volumes of sensitivity when brushing their teeth and eating or drinking cold and hot foods and beverages. Sensitive teeth may not be sensitive until triggered. Sensitivity can occur by several different triggers. Breathing through your mouth during the winter can cause a cold rush of air to pass by your teeth. This air can cause your teeth to start aching. Cold water and hot or cold food and beverages can also leave your teeth aching. Sensitive teeth can be bothersome and when the aching begins the only feeling beside the ache you feel is the need to rid your mouth of it. To help eliminate or to treat sensitive teach you can start by using toothpaste that is designed specifically for sensitive teeth. You can also purchase a special toothbrush for sensitive teeth, which normally have softer bristles than that of a regular soft toothbrush. Wearing a mouth guard while you sleep at night can help eliminate the problem of uncontrollable teeth grinding. Of course, practicing good hygiene and seeing a dentist once every six months can also help in treating sensitive teeth. Your primary dentist can help guide you in the right direction for picking out the products that best suit your needs and level of sensitivity. Do you have sensitive teeth? Call us today for more options.